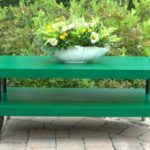 Another month has passed and it’s time for another round of “Themed Furniture Makeovers”. 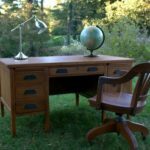 Each month a group of friends challenge each other to makeover a piece of furniture with a theme. 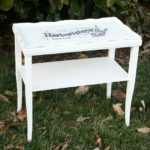 This month’s theme is small tables. In February my teacher assistant kindly gave me some of her aunt’s vintage things that other family members didn’t want. 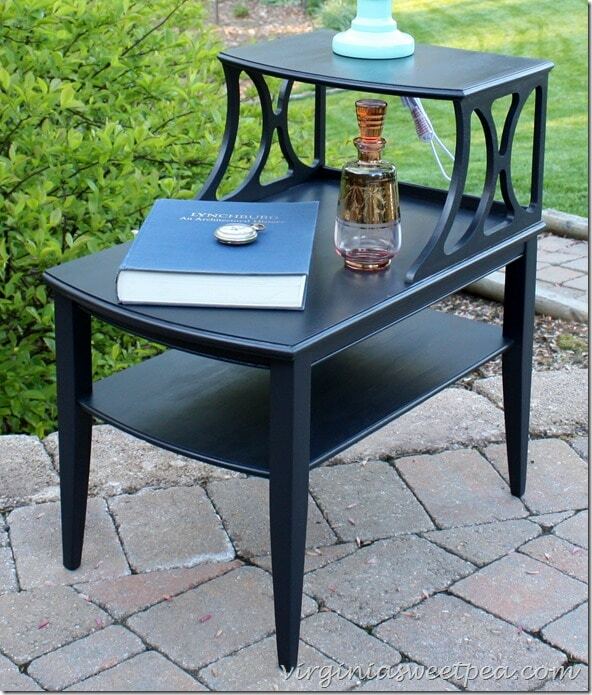 Among the treasures was an end table whose design I really liked. I lightly sanded the table to get rid of a few dings and worn spots that it had on the edges and then gave it three coats of Velvet Finishes paint in Luxurious. To protect the table, I used Velvet Finish’s Protect, a non-yellowing polyurethane. I really like this color and love how smooth it feels to touch. 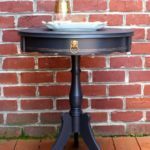 I am 100% pleased with this end table makeover. 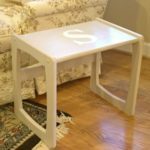 After I finished this table and prepared to take pictures of it, I realized that I didn’t have a lamp to use that coordinated with this table’s design. I picked this one up at Walmart especially to use for these pictures. I can always use another lamp, so I didn’t mind having to buy one. 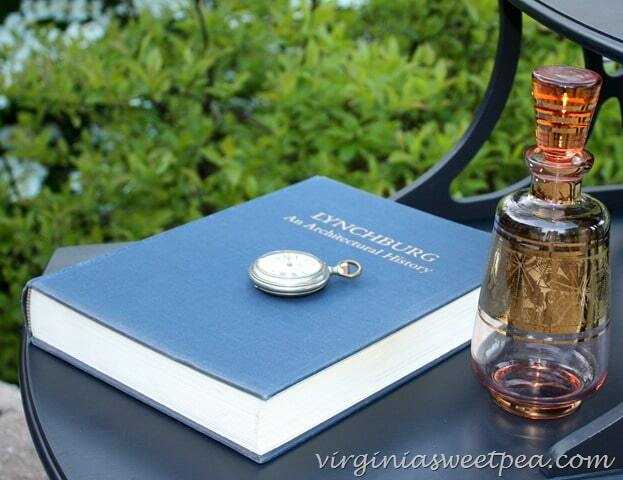 This pretty decanter was a gift from my friend when her mom moved out of her home. The book is out of print and hard to find. When I’m curious about the history of one of Lynchburg’s older homes, I pull this out to do a bit of research. Mr. SP bought this long before I met him. If you’ve ever been in my basement, you know that it looks like a combination of an antique and junk shop. I found this pocket watch on a shelf and am not sure where I got it. It probably was my grandfather’s. 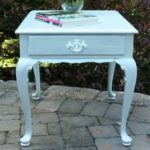 To see more “Themed Furniture Makeovers from this year and last year, click here. I’m counting down the days until school is over for the summer so that I can have some time at home to complete projects to share. I have a few started and a lot of ideas, just no time to implement them. Ten more days…I can do it! 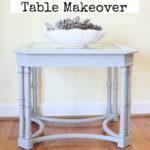 Scroll through the links below to see the small table makeovers that my friends completed. 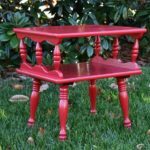 Table Makeover with Red – Themed Furniture Day! 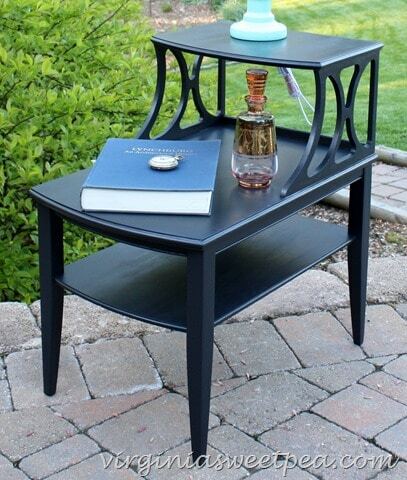 I love the lines and details of this table! t is just beautiful! Plus the color you picked is gorgeous. I need to try Velvet Finishes pint. I have a few painting projects in the works and this might be the ticket! I have four colors of Velvet Finishes paint. If you want to use one of them for a project, let me know. I wish your barn were closer to me, Beth. I’d like to find a match to my table to have a pair. It looks so classy painted black. And the lamp adds just the right amount of color. I always feel sorry for teachers this time of the year. I know you’re over it as much as the kids are. Summer is just around the corner! Thanks, Angie! Summer is just around the corner. Next week is only four days and one of them is a field trip, so it should fly by quickly. Thanks, Christy! I’ll bet that your kids are ready for school to be over, too. Great lines and a sweet makeover. This table is stylin’!! Fatastic work, Paula. Your table brings back memories of my grandmother’s living room. She had an end table just like that. 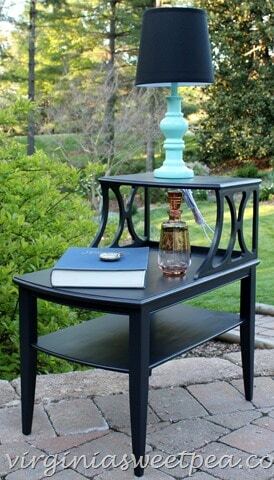 It’s really a nice design for a table and you did it proud with your Velvet paint. Oh that’s so pretty Paula. I’ve never used that Velvet Finish paint but wow, it looks just that…velvety!! Gorgeous finish. 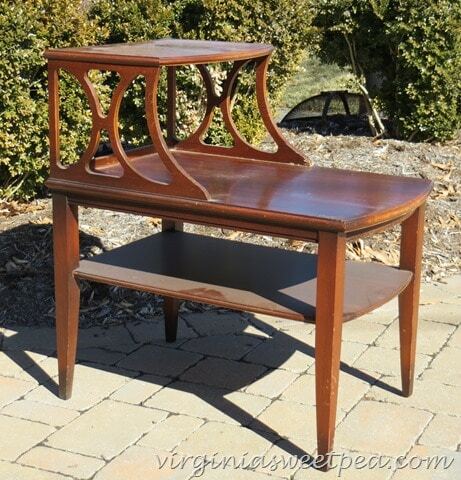 I love the shape of that table! I’ve seen a few of a similar style, but that is the best! 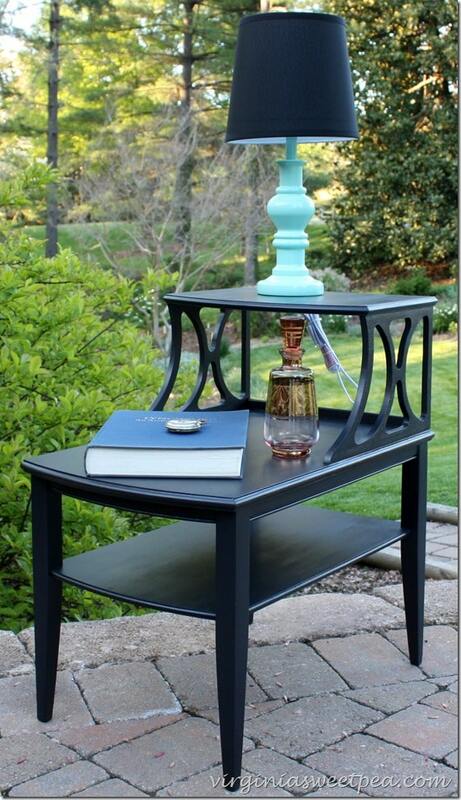 Need to try that paint too, love the finish. Have a great weekend! The table is so pretty now. I’ve never heard of Velvet Finishes. There are so many paints now I can’t keep up! I love the beautiful deep color you chose on this one. Great job! 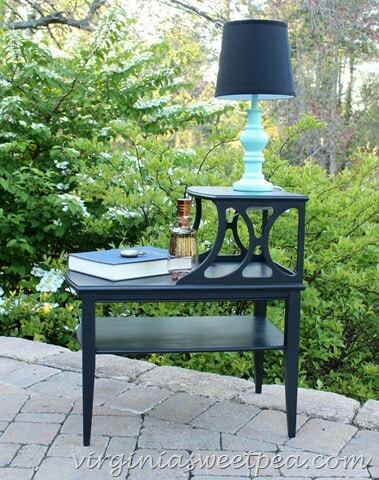 Love the color on this fun side table! 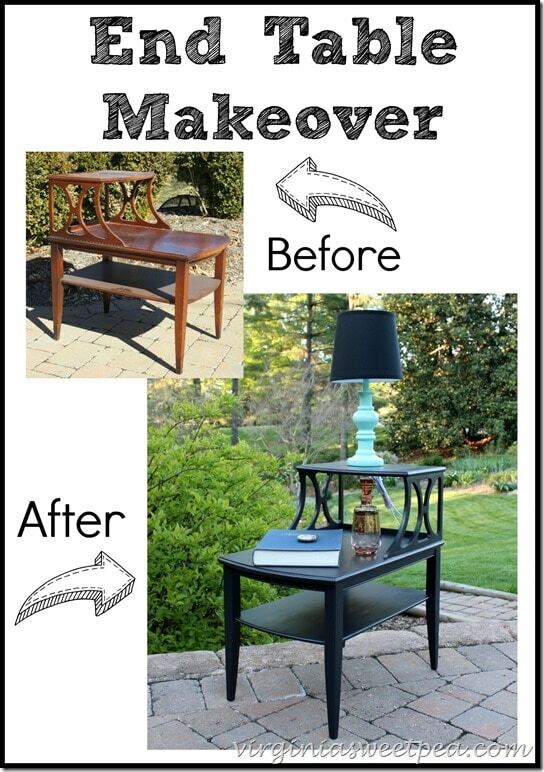 You did a major overhaul and it looks so darn good now! Pinned and sharing!! Great makeover! I just LOVE that color choice!